Crocker Mountain is a 4,228 foot mountain in the High Peaks in Carrabassett Valley, Maine in Franklin County. The mountain is traversed by the Appalachian Trail, which spans from Georgia to Maine. A glacial cirque called Crocker Cirque is located between Crocker and the lower summit of South Crocker Mountain. The Crocker Cirque contains a small pond which can be accessed via the Appalachian Trail. The Crocker Cirque Tentsite is located here, just 0.2 miles off the Appalachian Trail. All-in-all, Crocker Mountain and South Crocker Mountain are 2 of the easiest 4,000 footer mountains. (hiking in from Caribou Valley Road). The first mile of this hike is relatively flat. After reaching the Tentsite, the incline starts and can be steep in areas, but then it goes to a more gradual incline. The connecting trail between the two Crocker mountains is also fairly easy (for a 4,000 footer). 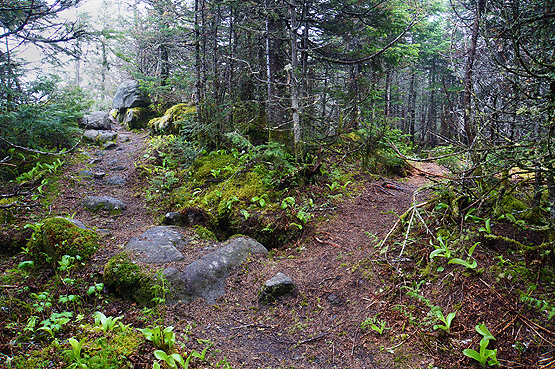 South Crocker Mountain is a 4,050 foot mountain in the High Peaks in Carrabassett Valley, Maine in Franklin County. The mountain is traversed by the Appalachian Trail, which spans from Georgia to Maine. A glacial cirque called Crocker Cirque is located between Crocker Mountain and the lower summit of South Crocker Mountain. The Crocker Cirque contains a small pond which can be accessed via the Appalachian Trail. Mount Redington is a 4,010 foot mountain in the High Peaks in Franklin County, Maine. The Appalachian Trail, which spans from Georgia to Maine, is routed around Redington to go over Sugarloaf Mountain. Mount Redington and Owl's Head in New Hampshire are the only 2 New England 4,000 Footers without maintained trails to the summits. But in reality, the trail to Owl's Head summit is so heavily hiked that the trail is obvious the entire way, while the trail to the summit of Mt. Redington is not as obvious. Since Mount Redington is on the Maine 4,000 footers list, so many people have hiked it, thus creating a herd path, which looks like a trail and is easy to follow in some areas, and difficult in others. The first half of this 1.20 mile stretch is a bit more tricky to stay on the path than the obvious second half heading up. 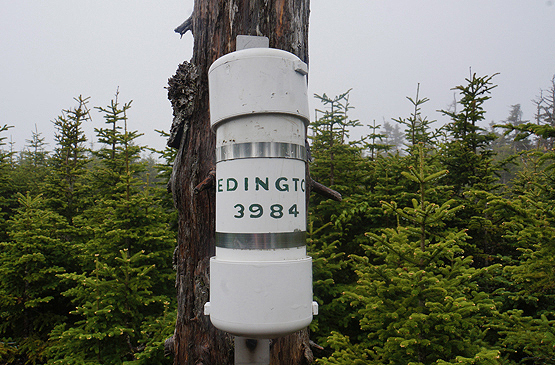 There is a white canister on the summit strapped onto a tree that can be very hard to find. But if you find it, usually there is a notebook with little notes and names of the people who have summited it. Canister on the summit of Redington on June 15, 2014. From Caribou Valley Road in Carrabassett Valley, ME, the trail starts on the right side of the road if you are coming from Route 16 / 27. It can be hard to miss, but we built a cairn in June 2014 at the start of the trail to make it more visible from the road. When you are driving on the road, you will pass several bridges (two that are wood, and in terrible condition, and one that is metal right before a hill), so you will have to use your judgment whether or not your vehicle can drive over this. If you are able to drive to the trail head, there is a small clearing that can fit several cars about 50 feet before it where you can park. Some people prefer to park before the bridges and walk the rest. From the trail head, where there is currently no sign on the road (but there is one that is easily missed about 20 feet in the trail up high), hike on the Appalachian Trail for 1.0 miles until you reach the turn for the Crocker Cirque Tentsite, which goes right. This first mile is easy. Flat and very little incline in some areas. From the tentsite junction, stay straight on the Appalachian Trail for another 1.1 miles where you will find yourself on the summit of South Crocker Mountain. 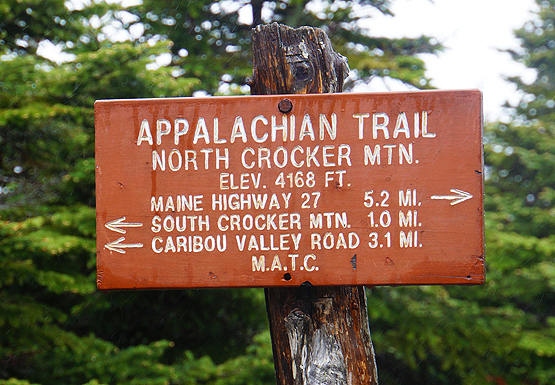 From the summit of S.Crocker, turn right to stay on the Appalachian Trail to head over to North Crocker Mountain. It is 1 mile away. This trail is relatively easy/moderate. To add Mount Redington onto this hike, head back over to South Crocker Mountain. Near the summit of South Crocker Mountain, there is a viewpoint off to the left. If you are looking at the path to head up to the viewpoint, there is also a worn down path on your right. That is the path you will take to head over to Redington. While this hike is the only Maine 4,000 footer with no trail to the summit, so many people have already hiked it, that their foot prints have worn in a herd path. The herd path is certainly obvious in alot of areas where the path leads, and in other areas, it is not so obvious. After you begin the herd path, hike until you come to what looks like a junction with another overgrown trail (this is the boundary line trail). Go right onto this and hike a couple hundred feet where you will then turn left into the woods. (no sign). DO NOT CONTINUE HIKING ON THE BOUNDARY LINE. It is a rough path that is not meant for hikers. After your turn into the woods, you will hike on this herd path for just over a mile where you will reach the summit of Mount Redington. 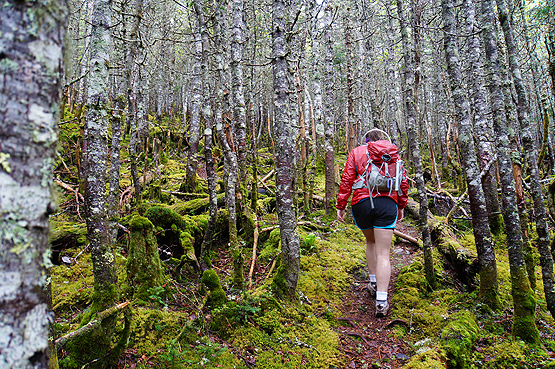 To get back to the road, hike back over to South Crocker Mountain, then down the Appalachian Trail for 2.1 miles. 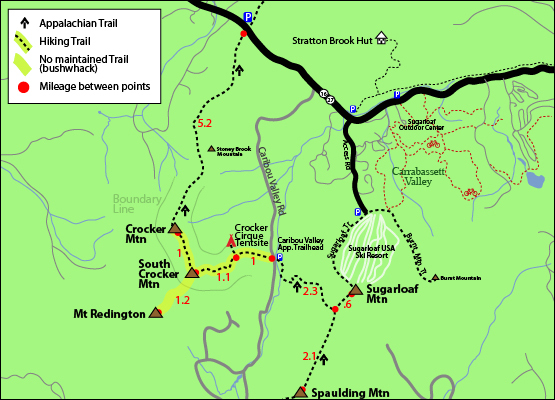 Click to download PDF Trail Map of Mount Redington, South Crocker and North Crocker Mountain. Photo of the viewpoint off South Crocker Mountain on the left, and the bushwhack herd path to Redington on the right on June 15, 2014. 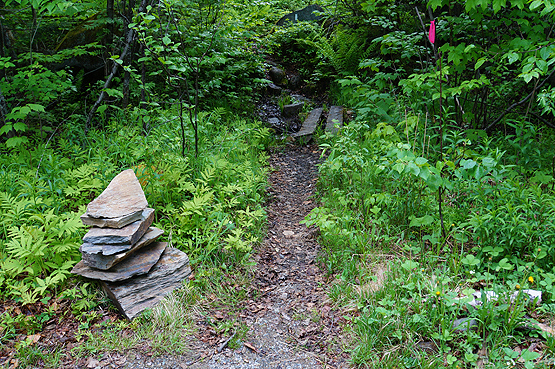 This part of the herd path is tight and narrow, but quite obvious on June 15, 2014. This is the open summit area of Mount Redington on June 15, 2014. At a viewpoint on the Appalachian Trail looking down to the Crocker Cirque on June 14, 2014. 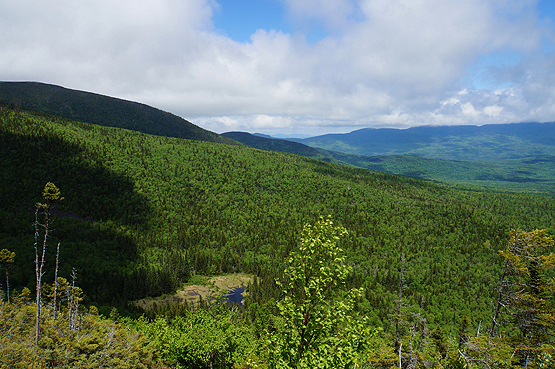 The beginning of the hike off Caribou Pond Road (Caribou Valley Road) on June 14, 2014. 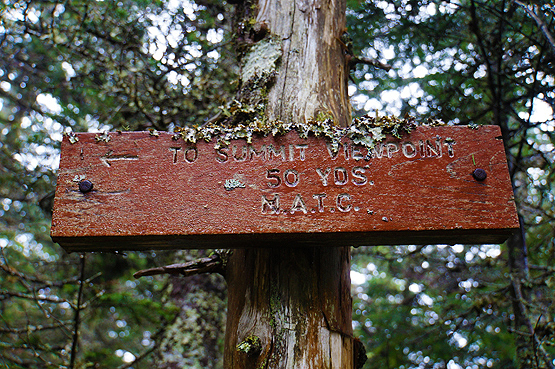 Summit sign on North Crocker Mountain on June 14, 2014. 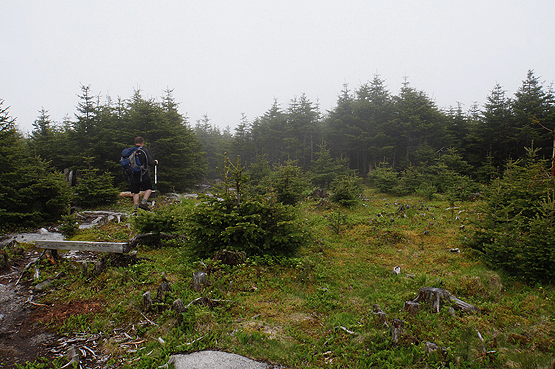 Close to the summit of South Crocker Mountain on June 14, 2014. To get to the trail head, take Route 27 northwest from the entrance to Sugarloaf ski area. It is roughly 1 mile from the Sugarloaf entrance to Caribou Valley Road (also called Caribou Pond Road) and will be on the left. This road was not signed in June 2014. The trail for this hike is 4.4 miles up the road. There is a small clearing for parking just before this. When you are driving on the road, you will pass several bridges (two that are wood, and in terrible condition, and one that is metal right before a hill), so you will have to use your judgment whether or not your vehicle can drive over this, otherwise some people opt to park before the bridges and walk the rest.